Balanced Food is according me.."Just taking the necessary calories your body need and also making it in the healthy way". A Women who is dieting should not have beyond 1200 calories. So accordingly have your breakfast,lunch,snacks and dinner. You can have upto 330 calories in the morning break-fast. see to that it stays within the limit of 230-330. 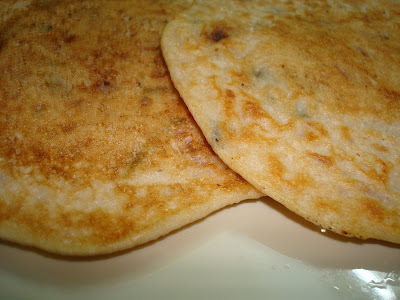 This Oats OOthappam will also be a suitable one with the calorie level. Now mix all the above and make thick dosa's. but let them cooked in medium flame.. I liked it a lot..My little one also liked it. This idea came to me..when i was in short of dosa batter. it worked out well too. you may also add grated carrot and cabbage to it. Enjoy the tasty also a healthy Break fast. and to SriValli's Dosa Mela. I admire her pictures....method of preparing...notes she give at the end..she is Surely Rocking. 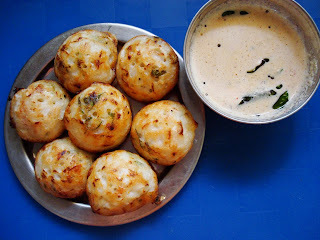 i still remember..the first dish i tried--Nune vankaya kura. from then..i just kept following her recipe. http://www.nandyala.org/mahanandi/archives/2005/10/31/pala-kova-doodh-peda/For my sweet tooth..i gathered all the patience and made this delicious doodh peda for our wedding day. http://www.nandyala.org/mahanandi/archives/2007/11/13/jihva-for-toor-dal-bisi-bele-huli-anna/her explainations never confuse us..and if we just follow..we will be never let down. 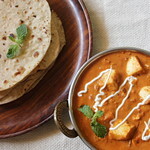 http://www.nandyala.org/mahanandi/archives/2005/06/06/delightful-paneer/i know..that paneer can be made in home..but how? Indira's pictorial explaination certainly impressed me to try. 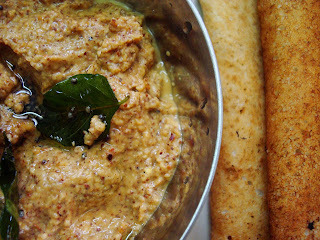 http://www.nandyala.org/mahanandi/archives/2006/11/29/brinjaljaggery-chutney-vankaya-bellam-pacchadi/My husband Hesitates to have brinjal..but this chutney.he could not find out what chutney is this..he liked it and said.."iam expecting Variety recipe's like this from you". 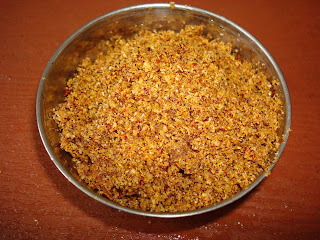 http://www.nandyala.org/mahanandi/archives/2005/11/11/idly-kaaram-podi/OMG...Really a tasty podi..i just follwed the measurements..and it was rocking...we finished this in 1 week. 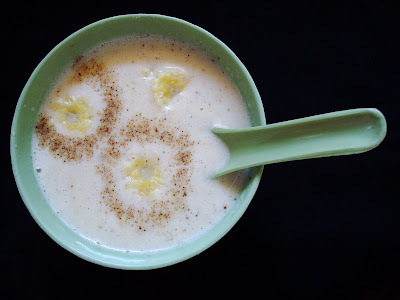 http://www.nandyala.org/mahanandi/archives/2006/07/19/bottle-gourd-in-yogurt-kaalan/Certainly a rewarding try out. we enjoyed it a lot. Well when i was patrolling..i have found many of them were already tried and many other's required ingredients which i did not have with me. 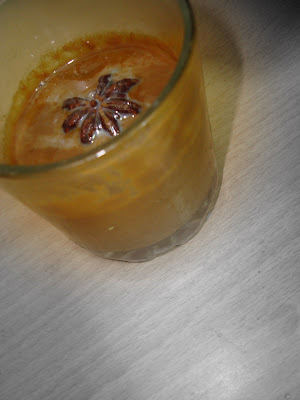 Finally i landed on Archana's culinary adventures blog and found this Spicy Hot Chocolate Drink. Her pictures naturally tempted me to try..Fortunately i had cocco powder, Unfortunately i did not have chocolate with me. So Coffee powder substituted the Chocolate . with all other spices I Kick started this lovely and excellent drink. So how about Coffee mixed with the flavours of Spices like cinnamon,cardamon,pepper and cloves for a Complete Mixed Drink Festive..
Iam sure coffee lover's will love this... I served it with Star Anise dipped in Condensed milkon the top of the coffee. I made it within 1o minutes.. well when i tasted it..i was really impressed with it's taste and how soon i prepared this delicious drink. Whatever I think of Clicking..My friends do them earlier and far better. Thus i have decided to Click Violently. 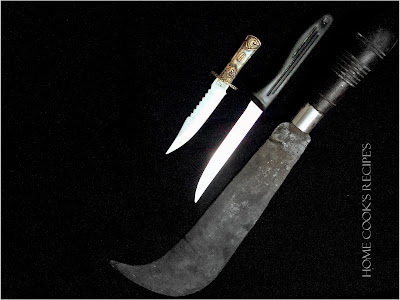 [From Your Right to Left]..
Mr.Thirupachi Aruva is used for breaking coconuts and for breaking Jack-Fruits(still i have not learned to use it..My husband does that well). Ms. Steely Beauty Knife is used for cutting vegetables and Fruits. Mstr. Smart Knife is used for cutting Lemon's and to peel the skin of vegetables. When I asked the above all to pose for a photo..every one agreed very happily..but Mr.Thirupachi Aruva was not So okay to show off himself in lime light. (don't think that he is off shy type..He is a very Bold Old one. If you watch Tamil/Telugu Movies..Every villain will be holding this Thirupachi Aruva to threaten us). and Now My panel of Cutting members are on their way to Jugalbandi's Click Event. http://jugalbandi.info/2008/02/click-march-2008-the-theme-is/ Meet and Garland them over there. Note: If any one could help me..with what is the english translation for Aruva..i will be so thankfull to you. 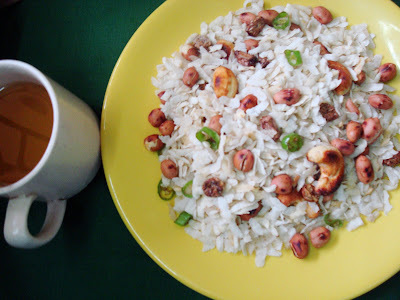 This Poha Mixture Recipe is from my Dear Friend. 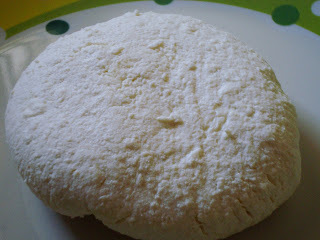 She told me about this yesterday..and today iam blogging this..then you got to imagine..how it would have tasted. a very simple recipe..a crowd pleaser, tummy filling one..rest you should try and let me know. Aval/poha mixture along with Mint tea. In a Wide kadai..put the Thin Aval and roast them well..soon it turns crispier(you have to taste to check it). Now transfer it into a bowl. roast the peanuts in the kadai. add it to the bowl. add a spoon of ghee..roast the cashews and raisins. and them to the bowl. fry the finely chopped green chilli slices and the curry leaves crispier and add it to the bowl. add salt(as required) to the bowl and mix well. Is it not easy...It tasted so good..raisins certainly added up the taste..
Peal the skin of potato, cut into small slices. take cauliflower and cut into small florets and boil it along with potato in water with a pinch of turmeric powder and salt. Have a wide skillet, heat the oil, add mustard, when it jumps, add cumin and fry it. now add garlic pieces. when it turned golden brown, add curry leaves, onion and green chillis. fry them well till the onions turn transparent. now add tomatoes and fry. add salt, pinch turmeric powder, chilli powder and garam masala. let them all mix togeather. now add boiled cauliflower and potato. mix them well. add a spoon of ghee at last and garnish it with corriander leaves. 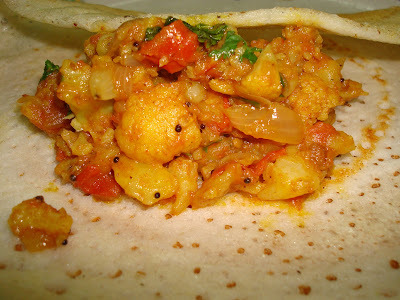 while serving with dosa..prepare coconut chutney and spread the chutney throughout the dosa and keep this cauliflower masala in between and fold it. 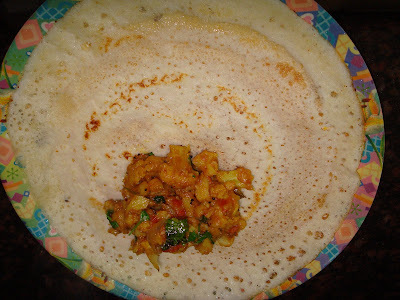 We used to have this Gobi-dosa in our favourite restaurant during our college days. Don't forget to spread coconut chutney over the dosa. Brinjal is my all time favourite veggie. when i prepared this..i had no idea of blogging this one. but when i tasted it..i wanted to blog. it turned out very tasty. Heat a Thick bottomed Pan, roast the peanuts, till they get roasted well. remove the peanuts aside and let it cool. Now heat a tbsp of oil in the pan and add the shallots / small onion's and fry them well. Ground the peanuts, shallots, garlic, tomato, red chilli, chilli powder and corriander powder with little salt into a thick paste. Give 2 slits on Brinjal's in X shape. Now stuff the Paste into it. Let it get marinate for 15 mins. so that the brinjals absorb the masala from the paste. Now in a Pan..heat the oil and add mustard..when it pops..drop the brinjal's one by one and fry them well in slow flame for about 7-10 mins. let the brinjals get cooked in the frying process itself. 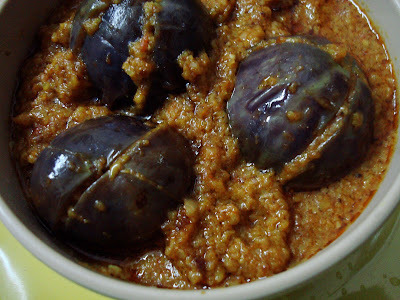 after the brinjal's change their color and cooked well..add the remaining paste. close it with a lid and let them stay in low flame. after 5-8 minutes..you will see oil on the side's of the pan. Now it's time to serve with Hot Rice. Absolutely a Finger-licking Curry.shallots and peanuts play their role perfectly. I have never used baby corns before..thought of giving a try. i started with pizza's. now this is the second one i have learned..BABY CORN SOUP. if you have not tried it before..shhh..you have missed out something great..so please give out a try.. the difference here is..the thickening agent is potato instead of the corn flour. Boil the Baby corns and the skin peeled potatoes in a pressure cooker with one cup of milk and with one cup of water and with little salt. (upto 4 whistles). 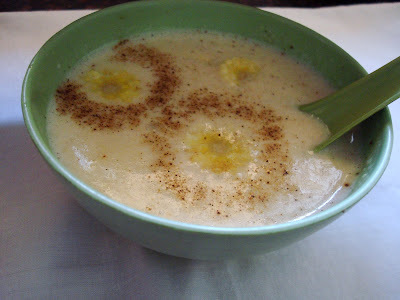 Grind the baby corns(4) and the potatoes with the milk(which is used for pressure cooking) into a thick paste. In a kadai..heat the ghee, fry the sliced onions and garlic well. now add the grinded mixture and mix well. add milk as per the consistecy you require. i preferred a thick one that is shown here. now with the other two boiled baby corns left over..slice them into pieces and add to the soup. add pepper powder and required salt. let them boil for few minutes. when i served this delicious soup to my husband..he asked me.."which hotel did you call up?" i said.. " No..i prepared this"..
my husband..."what all other foods you have ordered?" i said.."its mine..i prepared this soup"
my husband.."okay tell me how you prepared it"
Thank you Bharathy for sharing it out. 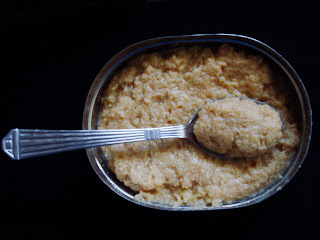 Kollu Thuvaiyal from Dhivya's Kitchen.. A different taste of chutney. it's good for health too.. will help in reducing the waist lines. 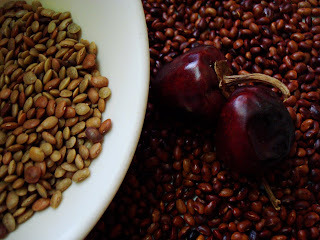 This horse gram should be soaked well for 12 hours and then boiled and can be used for making kollu Rasam. On having this Kollu Rasam during our monthly mensuration periods..it cleans our uterus and helps in reducing our waist lines too. 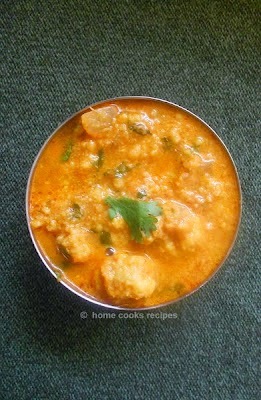 Those who are planning for babies can have kollu rasam during their periods. Thank You Dhivi for sharing this wonder full recipe of your mom's. 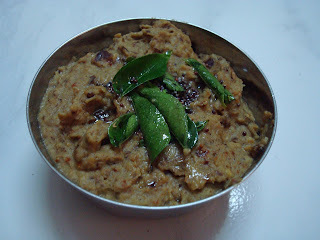 I tried kollu Chutney..just by frying out the horse gram and red chilli's and grinded it with grated Coconut. It certainly gave out a difference. 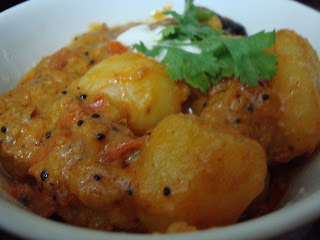 Dum Aloo from Shriya's Spicy Tasty. I love to cook with potatoes. Instead of cutting them into half and frying..i cooked with whole boiled. adding milk and curd to the gravy part certainly added up the taste. it perfectly matched Chapathi's. 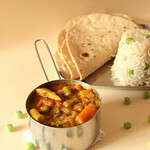 Thank you Shriya for Sharing this beautiful recipe. 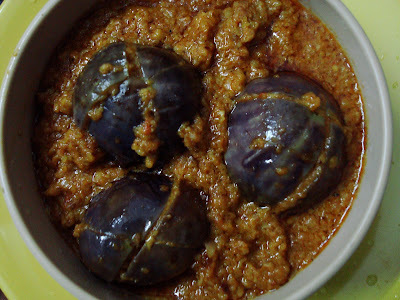 Boil the finely chopped brinjal pieces in adequate water. allow them to be cooked well. Now in a Kadai..heat 2 spoons of oil, add mustard..when it crackles add Slitted Green Chilli's. fry them. add asafoetida powder before adding chilli. Now add the cooked Brinjals and Dal. mix well. add turmeric powder and Salt and little water as per the consistency you require. 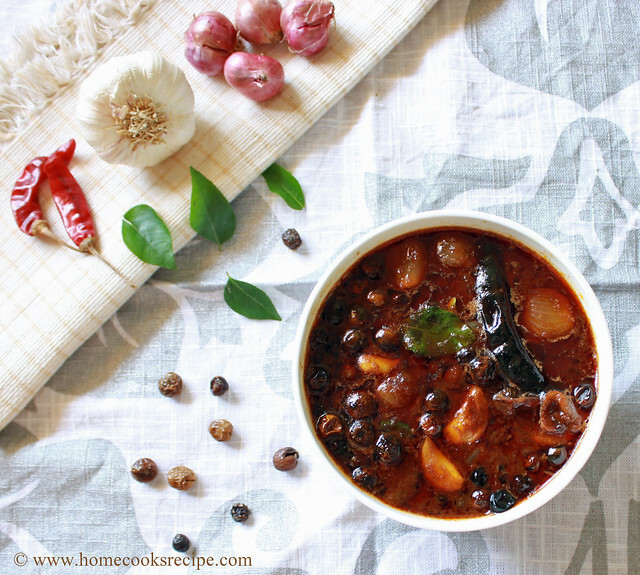 let it boil and garnish it with corriander leaves and serve with Hot Rice along with Rasam. 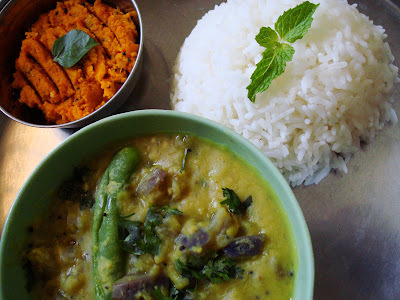 Brinjal Dal along with Carrot Thuvaiyal and Rice. 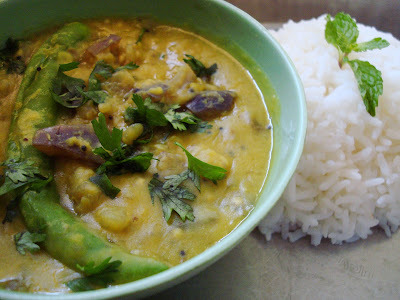 This Dal goes well with Chapathi's. I have Changed my Blog Template. I would love to hear your comments on it. mail id :lavraj2k4@gmail.com if you also want to enhance your blog appearances. i can help you with what i know.